The Tradesmart catalogue – is now online. It is jam packed with specials. From angle grinders to hammers, pliers to spanners, industrial fans and air compressors, all at great prices. Click the icon to the left to view the catalogue or pick up a copy when you are next in town. 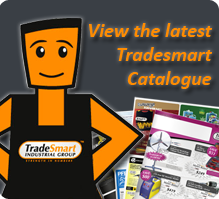 If you can’t find what you need in our tradesmart catalogue, then click on our suppliers below to download their catalogues.